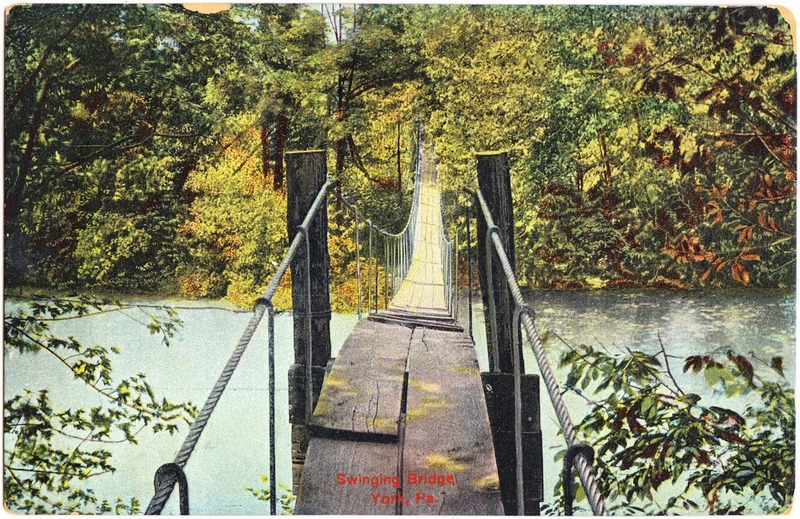 This postcard, probably circa 1908-1910, features the delightful "Swinging Bridge" over the Codorus Creek here in York County, Pennsylvania. Another view of this rickety-looking bridge appeared here last summer. And you can see that it was not a short jaunt. But it saved time, and that's what was important. Apparently. I know some people who probably would have walked 10 miles around to avoid this bridge. According Jim McClure's York Town Square blog, this bridge provided a shortcut for workers traveling from North York to York Safe & Lock. “A swinging bridge is just a two foot wide board about wide enough to walk on. There were cables on each side to hold on to as you go across. ... When you would get to the middle and somebody would come from the other way, you just had to stand aside and hold the wire and let them squeeze past, before you could continue on. ... We kids would go up there on that swinging bridge in the summertime and, in between working hours, we’d dive off of the bridge into the creek or we’d make it swing. You couldn’t swing it much, but a little bit." I'm pretty sure that description doesn't improve the appeal for people who dislike bridges ... and especially dislike swinging bridges. But it's not like it was a long way down. And bridge-goers were rarely being chased by sword-wielding baddies. As a final note, this postcard, which was never used, was published by J.G. McCrorey & Co. and was made in Germany.